Dahlias have always been favorites here, and more than a century ago, according a San Leandro Gazette article dated 1987, a local social organization was named the Dahlia Club. In time, the dahlia was designated the city’s official flower. A favorite story of the early years took place in 1919 when President and Mrs. Woodrow Wilson visited Oakland. Dr. Luther Michael sent dahlias from his garden to decorate the presidential suite at the Hotel Oakland with a card of greetings from the growers of San Leandro. The flowers were so well received that only dahlias decorated the suite during their stay, and a special note of thanks was sent to Dr. Michael. The next week, the Alameda County Floral Society held its first dahlia show with Dr. Michael and Mrs. Theodore Sachau being the only exhibitors from San Leandro. 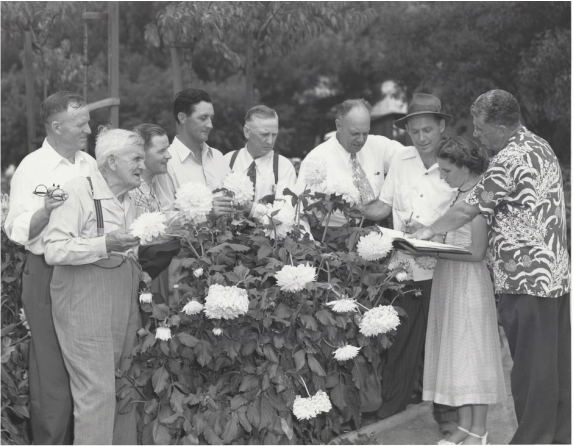 At some point, the San Leandro Dahlia Society formed and held its first show in 1925. Mrs. Luther Burbank, from Santa Rosa, contributed flowers from her husband, Luther Burbank’s, garden of hybrids. The San Quentin prisoners’ “Garden Beautiful” project also contributed flowers. The San Leandro Dahlia Society revived its own show again in 1934. Charles Garrity won the sweepstakes prize - $100! For many years the annual dahlia show took place at the Bay Fair shopping mall. Presently it is held at the Estudillo Library right where the meetings take place. Charles Garrity, a native to Scotland, developed over 50 new varieties of dahlias. Over the years, he received many honors, including the title of California Dahlia King at the Golden Gate Exposition in 1939.